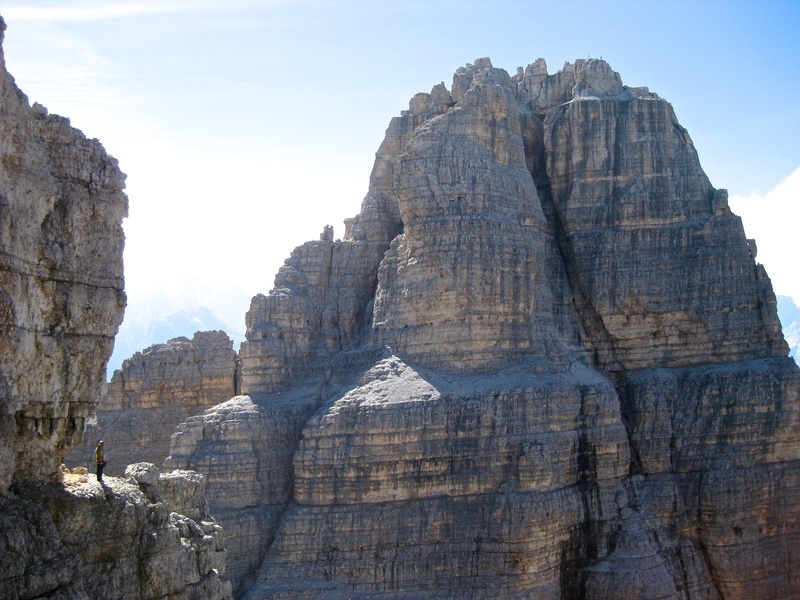 I’m going to start this post by admitting that the Dolomites have never really been on my climbing radar. Sure, I’d heard of friends going, stories of being stuck in tents in the rain or getting benighted on long, chossy multi pitches. Somehow the idea of doing either of these never really jumped to my attention. Anyway, Tim must have been sending me a lot of subliminal messages over the last year because somehow he managed to persuade me to sacrifice some holiday to go with him this August. So we filled my tiny Citroen C3 full of (mostly unnecessary, e.g two thermarests each) stuff and headed off to Dover! On friday night we slept in the car somewhere in Belgium before driving all Saturday, where we slept in it again because we could find no where to camp. 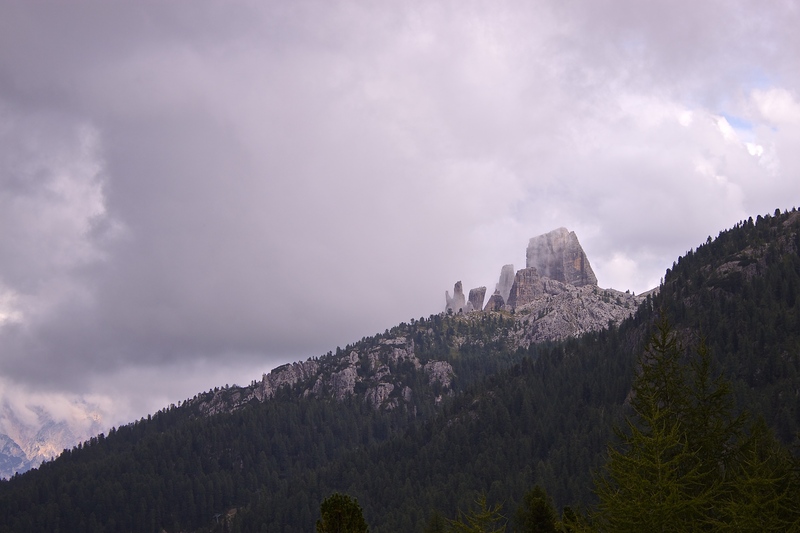 Feeling totally exhausted, we finished the drive on Sunday morning and prepared to do some single pitch sport climbing in the Gardena Pass as we were tired and the weather was quite cold and stormy. Parking below the crag I immediately noticed the huge face towering up behind it. A quick check of the guidebook revealed the face held a tasty looking 11 pitch 7a+. 11am and it was due to rain in the afternoon. Shall we go for it Tim? The weather looked utterly crap for the next day and possibly the one after so we decided to take a chance. Fun, pocketed climbing lead up to the 7a+ pitch which had some stiff pulls through a little roof. It was my pitch and I was psyched to onsight it by the skin of my teeth. 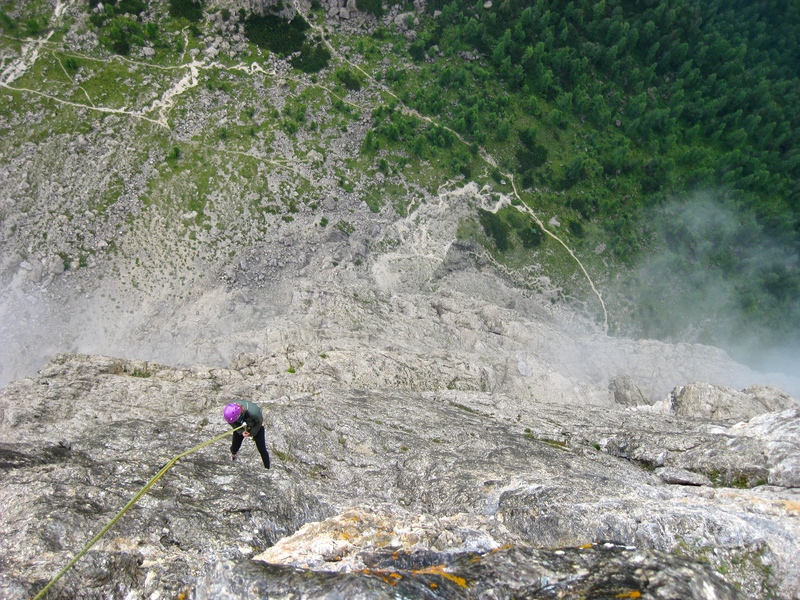 The last pitch brought the heavy rain and we quickly abseiled back down. We decided to be posh and stay in a campsite which was outrageously expensive (although we saved a couple euros by sacrificing the privilege of having the car next to the tent). Despite having a job now I still morph into the cheapskate climbing bum I am at heart when I leave the comforts of the city. 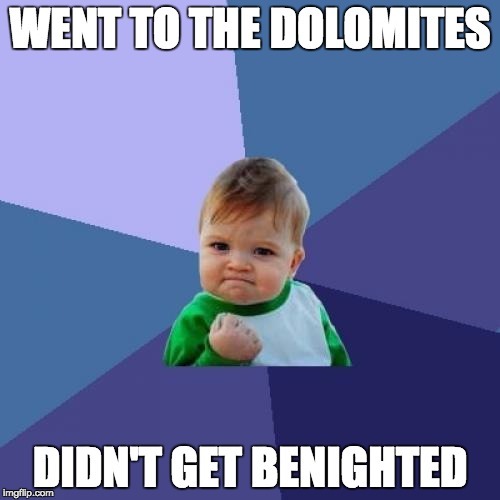 Hence I felt a little out of place in the Dolomites when not half way up a route. I really wasn’t expecting the mass crowds of very chic ‘outdoorsy’ tourists with all their patagucci and BMWs and 5* hotels and luxury rifugios. After the first two nights in the campsites we wild camped every night, although it wasn’t easy with almost every backroad being covered with signs prohibiting any form of dirtbag-ism. 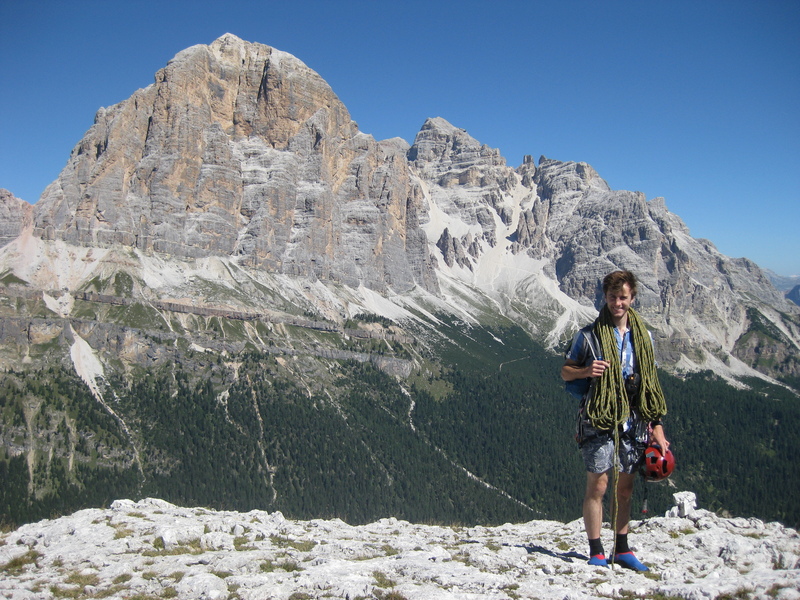 Rating of the Dolomites on the scale of best places to be a dirtbag? Probably about 3 out of 10. Luckily we brought all our own food although once we naively went to a shop for bananas and they were 80 cents each!! Rest day view of Cinque Torre from the other side of the valley. 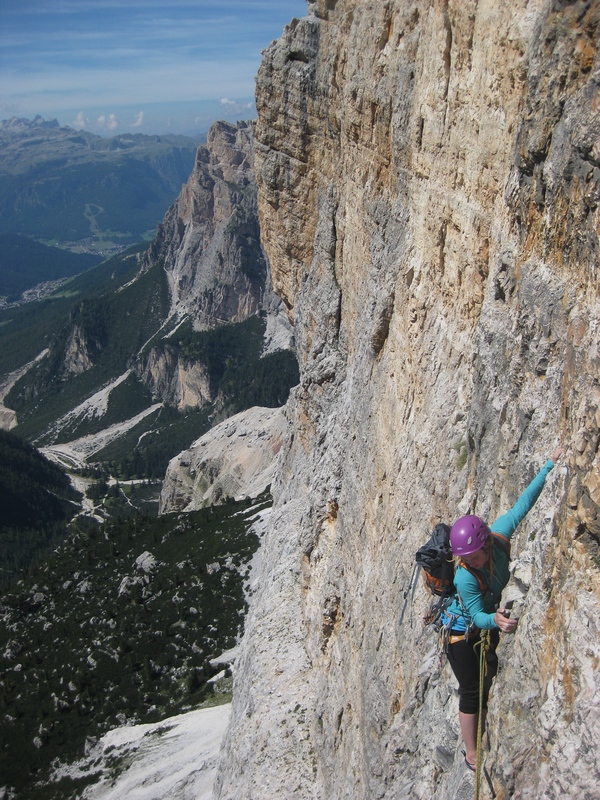 Anyway, after two rain enforced rest days we finally got on with some more climbing. On Wednesday we visited the awesome Cinque Torre, the main event of the day being the 5 pitch Direttisima Scoiattoli (English translation: squirrel) up the biggest tower (Torre Grande). This route was graded VIII- which is supposed to be about E4 but the first and hardest pitch was almost fully bolted, despite being a crack so the grade was a bit misleading. The subsequent pitches were quite adventurous and the last pitch (which should have been VS) had a completely nails boulder problem and turned out to be 60 metres rather than 15 as the guide would have us believe! The following day we got up at the appallingly early time of 3.45am to get on the Comici (apparently its famous and starting early is essential). I thought the time was totally unnecessary as we approached in the dark silence, however, soon after us followed at least 6 more teams and our best speed climbing skills were employed to avoid sharing a belay with some nifty Australians. The route actually exceeded my expectations. All the harder pitches had fantastic climbing and watching the sun rise was simply beautiful. 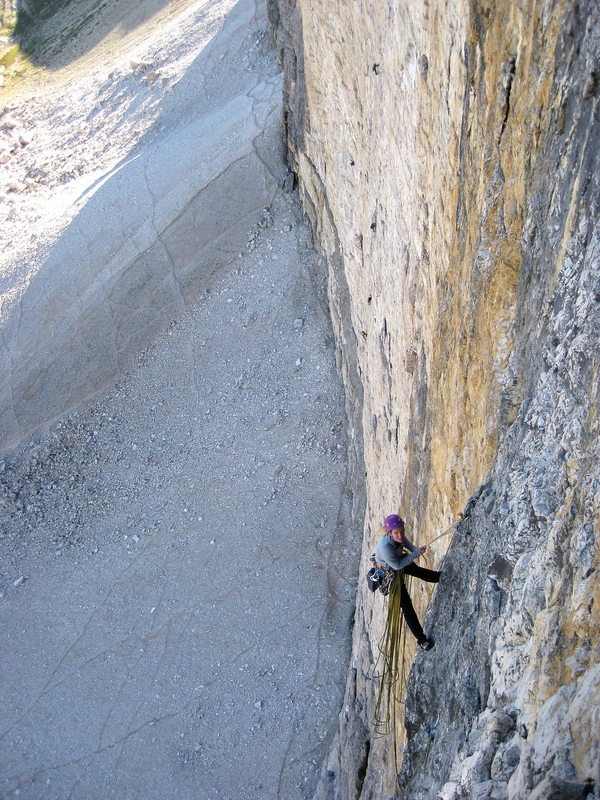 I lead the crux pitch, although it probably would have been harder to second with the backpack! 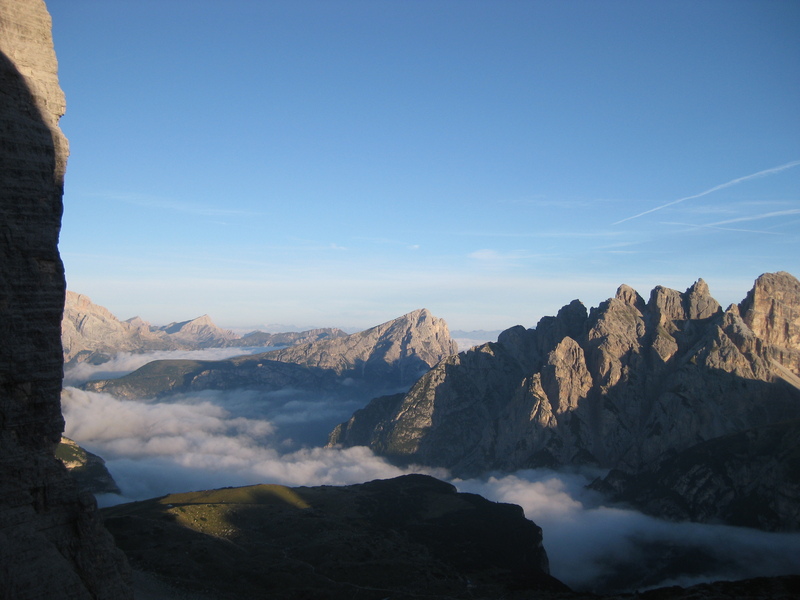 On Friday we decided to have a more restful day by only getting up at 5am to do The Lacadelli (another VIII-) on the southwest facing Cima Scotoni. After a 90 minute uphill approach we wasted loads of time being unable to figure out where the route started and consequently soloed two pitches trying to find out where it went. After a false start up the wrong route, we eventually found some threads up some wildly steep wall. That pitch felt about 7a on pegs and I was only just able to second clean due to cold fingers and no real warm up. The next two pitches were relatively straightforward but the one after saw Tim soloing up a steep, extremely snappy and quite difficult wall with not a smidge of gear. 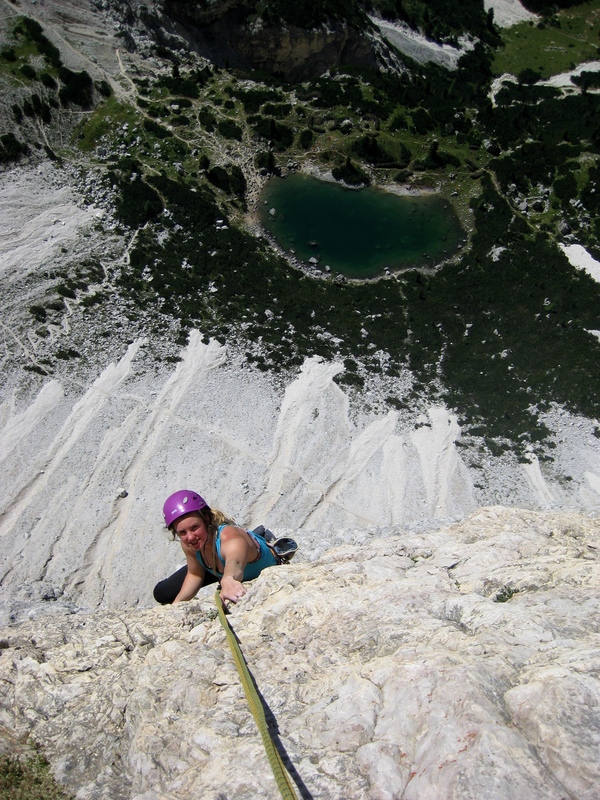 I was completely terrified belaying and then again seconding where I would have taken a gigantic pendulum had I fallen! Immediately after that we were in the sun where you probably could have fried an egg on our helmets. The upper pitches involved massively exposed traversing on snappy rock with the odd peg and blindly hoping we’d come across belays to indicate we were on vaguely the right line! 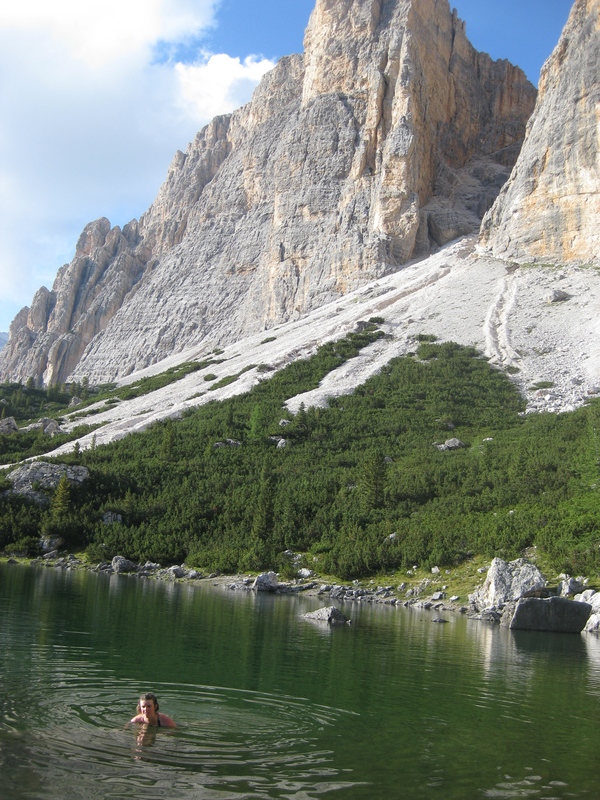 Returning to the bottom of the mountain we had a nice swim in the lake to relax the muscles (and the mind, i.e. thank goodness we survived that). 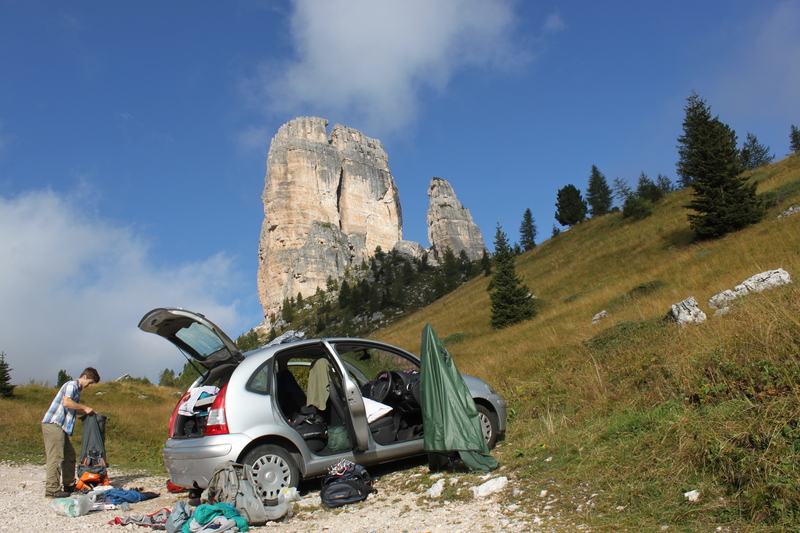 Our last day on Saturday was the most chill just doing a really lovely 5 pitch VI+ (E1) called Finlandia on Torre Grande. A nice end to the trip on good, solid rock. Wonderful place -remember it well. Just as well! Don’t imagine I’ll be visiting there again! Going down hill so fast I don’t think I’ll be going anywhere!! Enjoy yourselves, I’m with you in spirit if not in the flesh! !